This project is supported by a Seed Grant from the Gulf Coast Center for Computational Cancer Research funded by John & Ann Doerr Fund for Computational Biomedicine. Our objective is to demonstrate that patient-specific computer modeling of arterial dynamics and blood flow will, in not so distant future, become a medical diagnostic and decision-making tool that can save lives. We will demonstrate that the advanced, parallel computer modeling techniques we have developed, the medical knowledge and experience of our collaborators from the Texas Medical Center, and Rice's parallel computing resources, collectively, make us the right team to make that happen -- sooner rather than later. 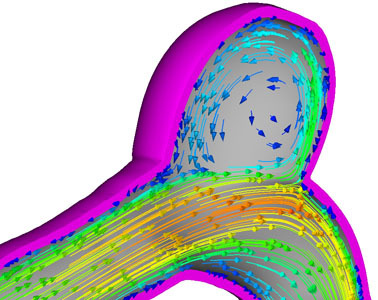 We will demonstrate the success of the techniques developed for patient-specific computer modeling of arterial dynamics and blood flow and the interaction between the two. We will show that, with the advanced numerical techniques we have developed, we are successfully addressing the main computational challenge involved: fluid-structure interactions between the blood flow and arterial walls. The blood flow depends on the arterial geometry, and the deformation of the arterial wall depends on the blood flow. 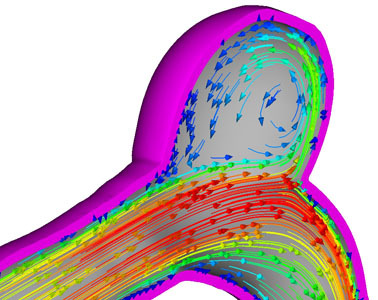 The equations governing the blood flow and arterial deformation need to be solved simultaneously, with proper kinematic and dynamic conditions coupling the two physical systems. Without that the modeling cannot be realistic. We plan to, in collaboration with researchers from the Texas Medical Center, identify patient-specific arterial data in different categories and demonstrate the effectiveness of the techniques in computer modeling of arteries in those categories. We plan to improve the accuracy, detail and comprehensiveness in representing the patient-specific artery segments. This will include improving how we represent the arterial geometry and material properties, blood properties, and tissues surrounding the arteries. Also in collaboration with researchers from the Texas Medical Center, we plan to design effective ways of processing, displaying and interpreting the results obtained from the computer modeling. The goal will be to find the best way to process and present the computed data so that it is most helpful to the medical doctors in making decisions and acting on those decisions. By the end of this project our collaborative research team will be in a competitive position for longer-term and larger projects with more comprehensive collaboration between Rice and the Texas Medical Center, with the long-term objective of making our computer modeling a medical tool that can save lives. Much has been accomplished by the T*AFSM in fluid-structure interaction modeling research since the early 1990's. Still, we have been introducing new versions of our computer modeling techniques to increase their scope, accuracy, robustness and efficiency (see ). We have also recently applied these techniques to arterial dynamics and blood flow and the interaction between the two (see [2-8]). Fig. 1 is an example from . Fig. 1. Deformation patterns of a middle cerebral artery segment with aneurysm. Different levels of deformations correspond to normal and high blood pressure cases and different arterial wall thicknesses at the aneurysm. For details, see . The arterial geometry (see Fig. 2) is a close approximation to the patient-specific image-based geometry used in . The geometry used in  was extracted from the computed tomography model of a segment of the middle cerebral artery of a 57 year-old male with aneurysm. Fig. 2. Middle cerebral artery with aneurysm -- single-artery segment. Problem geometry. For details, see . 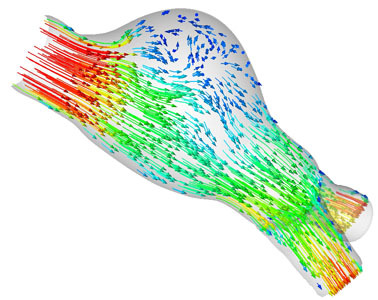 The arterial wall is modeled with the continuum element made of hyperelastic (Fung) material (see  for details). 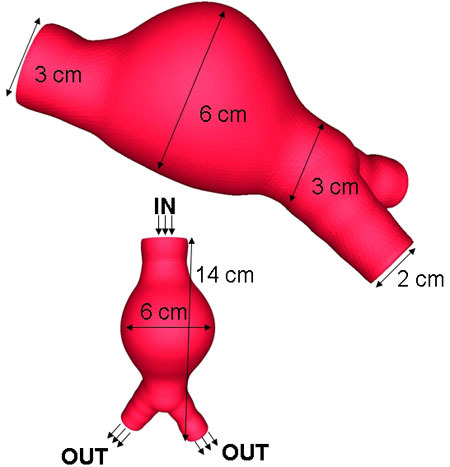 We do this test computation with the "estimated zero-pressure arterial geometry", as described in [5, 6]. Time-averaged value of the blood pressure (see [5, 6] for its significance), obtained by averaging over a cardiac cycle, is 91.7 mm Hg. Fig. 3 illustrates the shape of the artery and the blood flow patterns at the instants corresponding to maximum inflow and maximum blood pressure. Fig. 3. Middle cerebral-artery with aneurysm -- single-artery segment. Computed with the continuum element made of hyperelastic (Fung) material. Flow field at the instants corresponding to maximum inflow (left) and maximum blood pressure (right). Velocity vectors colored by magnitude. For details, see . The arterial geometry and other data (see Fig. 4) are based on a collection of references given in . The pulsating inflow velocity profile as a function of time is not shown here but has the same form as that shown in Fig. 2. Fig. 4. Abdominal aortic aneurysm. Problem geometry. For details, see . The structural model is based on the membrane element (see  for details). We computed this test case with both the fully coupled arterial FSI (CAFSI) and Sequentially-Coupled Arterial FSI (SCAFSI) techniques. 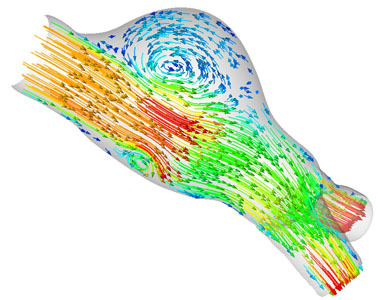 The SCAFSI technique was first proposed in  as an approximate FSI approach in arterial fluid mechanics. In the SCAFSI technique, first we compute a "reference" (i.e. "base") arterial deformation as a function of time, driven only by the blood pressure, which is given as a function of time by specifying the pressure profile in a cardiac cycle. Then we compute a sequence of updates involving mesh motion, fluid dynamics calculations, and recomputing the arterial deformation. For details, see [3, 6]. Fig. 5 illustrates the shape of the artery and the blood flow patterns at the instants corresponding to maximum inflow and maximum blood pressure. The results obtained with the SCAFSI technique are very close, pratically idenitical, to the results obtained with the CAFSI technique, leading us to conclude that when needed the SCAFSI technique can be used in place of the CAFSI technique without any loss of accuracy. Fig. 5. Abdominal aortic aneurysm. Computed with the SCAFSI technique. Flow field at the instants corresponding to maximum inflow (left) and maximum blood pressure (right). Velocity vectors colored by magnitude. For details, see . 1. T.E. Tezduyar and S. Sathe, "Modeling of Fluid-Structure Interactions with the Space-Time Finite Elements: Solution Techniques", International Journal for Numerical Methods in Fluids, 54 (2007) 855-900. 2. T.E. Tezduyar, S. Sathe, T. Cragin, B. Nanna, B.S. Conklin, J. Pausewang and M. Schwaab, "Modeling of Fluid-Structure Interactions with the Space-Time Finite Elements: Arterial Fluid Mechanics", International Journal for Numerical Methods in Fluids, 54 (2007) 901-922. 3. T.E. 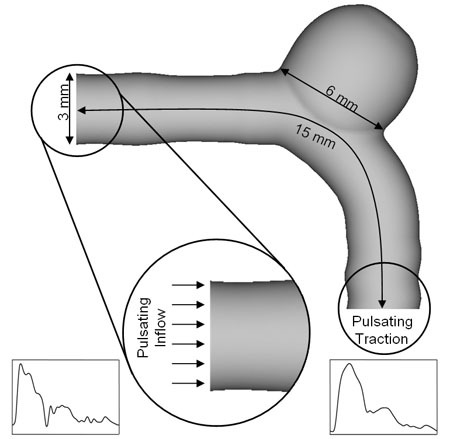 Tezduyar, M. Schwaab and S. Sathe, "Arterial Fluid Mechanics with the Sequentially-Coupled Arterial FSI Technique", Coupled Problems 2007, E. Onate, M. Papadrakakis and B. Schrefler (Eds), CIMNE, Barcelona, 2007. 4. T.E. Tezduyar, T. Cragin, S. Sathe and B. Nanna, "Arterial Fluid Mechanics with the SSTFSI Technique and Continuum Element Made of Hyperelastic (Mooney-Rivlin) Material", Coupled Problems 2007, E. Onate, M. Papadrakakis and B. Schrefler (Eds), CIMNE, Barcelona, 2007. 5. T.E. Tezduyar, T. Cragin, S. Sathe and B. Nanna, "FSI Computations in Arterial Fluid Mechanics with Estimated Zero-Pressure Arterial Geometry", Marine 2007, P. Bergan, J. Garcia, E. Onate and T. Kvamsdal (Eds), CIMNE, Barcelona, 2007. 6. T.E. Tezduyar, S. Sathe, M. Schwaab and B.S. Conklin, "Arterial Fluid Mechanics Modeling with the Stabilized Space-Time Fluid-Structure Interaction Technique", International Journal for Numerical Methods in Fluids, published online, October 2007, DOI: 10.1002/fld.1633. 7. T.E. Tezduyar, S. Sathe, M. Schwaab, B.S. Conklin and J. Pausewang, "Arterial Fluid Mechanics Modeling with the Stabilized Space-Time FSI Technique", Proceedings of the Third Asian-Pacific Congress on Computational Mechanics, Kyoto, Japan, CD-ROM (2007). 8. B.S. Conklin, S. Sathe and T.E. Tezduyar, "Venous Valve Fluid-Structure Interaction Modeling", Proceedings of the Third Asian-Pacific Congress on Computational Mechanics, Kyoto, Japan, CD-ROM (2007).